The role of support for game-based learning cannot be overemphasized. 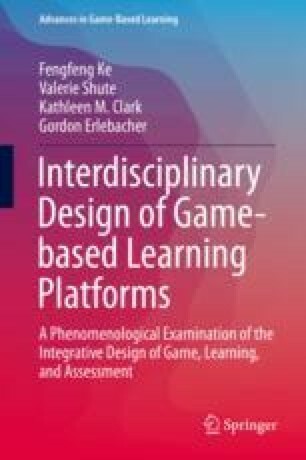 It remains inconclusive as to what, when, and how support for learning should be designed and implemented to foster learners’ extended engagement, in-game performance, and game-based disciplinary knowledge learning and transfer. In this chapter, we review prevalent support features in digital games, prior theoretical and empirical research on scaffolding and support in game-based learning, and the support design conjectures deemed effective. We then share our observations of the obstacles that learners experienced in game-based learning processes when using E-Rebuild, describe the corresponding learning support strategies and features, and report the findings from the iterative testing and refinement of these support features. Propositions for future research and the design of support for game-based learning are discussed in relation to the current project findings and prior research. Bos, N. (2001). What do game designers know about scaffolding? Borrowing SimCity design principles for education. Ann Arbor, MI: University of Michigan and CILT, PlaySpace Project, Retrieved from http://concepts.concord.org/projects/PlaySpace/application/pdf/Learning%20from%20SIMCITY.pdf.